PPARγ agonists ameliorate insulin resistance and dyslipidemia in type 2 diabetic patients. Adiponectin possesses insulin sensitizing properties, and predicts insulin sensitivity of both glucose and lipid metabolism. In diet-induced insulin resistant rats and ZDF rats, the current studies determined the correlation between PPARγ agonist-upregulated fatty acid binding protein(FABP3) mRNA in adipose tissue and PPARγ agonist-elevated serum adiponectin, and the correlation between PPARγ agonist-elevated serum adiponectin and PPARγ agonist-mediated efficacy in insulin sensitization and lipid lowering. Parallel groups of SD rats were fed a high fat/sucrose (HF) diet for 4 weeks. These rats were orally treated for the later 2 weeks with vehicle, either PPARγ agonist GI262570 (0.2–100 mg/kg, Q.D. ), or GW347845 (3 mg/kg, B.I.D). Rats on HF diet showed significant increases in postprandial serum triglycerides, free fatty acids (FFA), insulin, and area under curve (AUC) of serum insulin during an oral glucose tolerance test, but showed no change in serum glucose, adiponectin, and glucose AUC. Treatment with GI262570 dose-dependently upregulated adipose FABP3 mRNA, and increased serum adiponectin. There was a positive correlation between adipose FABP3 mRNA and serum adiponectin (r = 0.7350, p < 0.01). GI262570 dose-dependently decreased the diet-induced elevations in triglycerides, FFA, insulin, and insulin AUC. Treatment with GW347845 had similar effects on serum adiponectin and the diet-induced elevations. There were negative correlations for adiponectin versus triglycerides, FFA, insulin, and insulin AUC (For GI262570, r = -0.7486, -0.4581, -0.4379, and -0.3258 respectively, all p < 0.05. For GW347845, r = -0.6370, -0.6877, -0.5512, and -0.3812 respectively, all p < 0.05). In ZDF rats treated with PPARγ agonists pioglitazone (3–30 mg/kg, B.I.D.) or GW347845 (3 mg/kg, B.I.D. ), there were also negative correlations for serum adiponectin versus glucose, triglycerides, FFA (for pioglitazone, r = -0.7005, -0.8603, and -0.9288 respectively; for GW347845, r = -0.9721, -0.8483, and -0.9453 respectively, all p < 0.01). This study demonstrated that (a) PPARγ agonists improved insulin sensitivity and ameliorated dyslipidemia in HF fed rats and ZDF rats, which were correlated with serum adiponectin; (b) Serum adiponectin was positively correlated with adipose FABP3 mRNA in GI262570-treated rats. These data suggest that serum adiponectin can serve as a biomarker for both in vivo PPARγ activation and PPARγ agonist-induced efficacy on insulin resistance and dyslipidemia in rats. Type 2 diabetes mellitus (T2D) and the metabolic syndrome are characterized by resistance to the action of insulin in peripheral tissues, including skeletal muscle, liver, and adipose. Activation of the peroxisome proliferator-activated receptor gamma (PPARγ) improves insulin sensitivity and lowers circulating levels of glucose, triglycerides and free fatty acids without stimulating insulin secretion in rodent models of T2D [1, 2]. PPARγ agonists also alleviate peripheral insulin resistance in humans, and have been effectively used in treatment of T2D patients [3–5]. Fatty acid binding protein(FABP3), adipocyte lipid binding protein(aP2) and lipoprotein lipase (LPL)are response genes of PPARγ and are indicators for in vivo PPARγ activation in adipose tissue [6–9]. Adiponectin, an adipose-specific plasma protein, possesses insulin sensitizing and anti-atherogenic properties . It has been well documented that plasma adiponectin is lower in obese subjects than in lean subjects, lower in diabetic patients than in non-diabetic patients [10–13], and is negatively correlated with body weight, visceral fat mass, and resting insulin level [11, 12]. Hotta et al also reported that adiponectin decreased in parallel with the progression of T2D in rhesus monkeys, and there is a strong correlation between plasma adiponectin and systemic insulin sensitivity . Studies by Maeda et al showed that adiponectin knockout mice developed hyperglycemia and hyperinsulinemia while on HF diet, which was reversed by adenoviral-mediated adiponectin expression . Exogenous adiponectin also lowered hepatic glucose production during a pancreatic euglycemic clamp , and increased post-absorptive insulin-mediated suppression of hepatic glucose output . The PPARγ agonist, class of insulin sensitizer, has the marked effect of up-regulating serum adiponectin. Combs et al reported that the PPARγ agonist rosiglitazone increased plasma adiponectin in db/db mice . Yang et al reported rosiglitazone increased plasma levels of adiponectin in type 2 diabetic patients . Tschritter et al analyzed the associations between plasma adiponectin and insulin sensitivity and serum lipid parameters in nondiabetic individuals, and concluded that plasma adiponectin predicts insulin sensitivity of both glucose and lipid metabolism . While PPARγ agonists increase plasma adiponectin and adiponectin levels predict insulin sensitivity, there is not a clear demonstration of the relationships among PPARγ agonist-increased adiponectin and PPARγ agonist-mediated efficacy on insulin sensitivity/in vivo PPARγ activation. Therefore, the current studies were designed to define these relationships and assess serum adiponectin as a biomarker for in vivo PPARγ activation and PPARγ agonist-induced efficacy on insulin sensitization and lipid lowering. Rats on the HF diet for 4 weeks showed marked insulin resistance and dyslipidemia, indicated by significant increases in postprandial serum levels of triglycerides, free fatty acids, insulin, and area under curve (AUC) for serum insulin during OGTT. But the HF diet did not cause changes in postprandial serum glucose or OGTT glucose AUC compared with rats on normal diet, consistent with an insulin resistant, pre-diabetic phenotype. Serum adiponectin level in rats on HF diet was slightly higher than that in normal diet rats at week 2, but back to the same level at week 4 (Table 1). HF diet induced changes in SD rats. *p < 0.05 vs Before diet, **p < 0.01 vs Before diet, ++p < 0.01 vs Normal diet. As showed in Fig. 1, treatment of SD rats on HF diet with GI262570 for 2 weeks dose-dependently increased serum adiponectin, and upregulated adipose FABP3 mRNA without effect on housekeeper genes 18S, β-actin, and cyclophilin. There was a positive correlation between adipose FABP3 mRNA and serum adiponectin (Pearson Correlation Coefficients 0.7350, p < 0.01). A marked increase in serum adiponectin was also observed in GW347845-treated HF fed SD rats (30.93 ± 0.45 vs 4.86 ± 0.30 μg/ml in vehicle. p < 0.01). Efeects of PPARγ agonist GI262570 on serum adiponectin level (a), adipose FABP3 mRNA level (b), and the correlation between serum adiponectin and adipose FABP3 mRNA. SD rats were on HF diet for 4 weeks. GI262570 was oral dosed for the later 2 weeks. Mean ± SEM. N = 5–8 in each group. *p < 0.05 vs vehicle. **p < 0.01 vs vehicle. Treatment of rats on HF diet with GI262570 for 2 weeks significantly decreased the diet-induced elevations in postprandial serum triglycerides, free fatty acids, insulin, and insulin AUC in a dose-dependent manner (Fig. 2). Treatment with GW347845 showed a qualitatively similar effect to that of GI262570 treatment (Table 2). There were negative correlations for adiponectin versus triglycerides, free fatty acids, insulin, and insulin AUC (For GI262570, r = -0.7486, -0.4581, -0.4379, and -0.3258; p < 0.005, 0.005, 0.01 and 0.05 respectively, Fig. 3; For GW347845, r = -0.6370, -0.6877, -0.5512, and -0.3812, p < 0.01, 0.01, 0.01 and 0.05 respectively, Table 2). Effects of PPARγ agonist GI262570 on serum insulin, triglycerides, free fatty acids, and insulin AUC during OGTT. SD rats were on HF diet for 4 weeks. GI262570 was oral dosed for the later 2 weeks. Mean ± SEM. N = 7–9 in each group. Effect of GW347845 (3 mg/kg, B.I.D.) in rats on HF diet. Corr. Coeff. : Pearson Correlation Coefficient. *p < 0.05 vs Normal diet. **p < 0.01 vs normal diet. ++p < 0.01 vs diet-vehicle. N = 7–8 in each group. Correlation between PPARγ agonist GI262570 (0.2–100 mg/kg)-elevated serum adiponectin and GI262570-decreased serum insulin, triglycerides, free fatty acids, and insulin AUC during OGTT in HF fed SD rats. Compared with Zucker lean rats, ZDF rats had higher serum insulin, glucose, TG, FFA, but similar serum adiponectin levels. Treatment of ZDF rats with PPARγ agonist pioglitazone or GW347845 for 2 weeks resulted in significantly lower serum glucose, triglycerides, free fatty acids, and modestly lower serum insulin, compared to vehicle treatment. Both pioglitazone and GW347845 markedly increased serum adiponectin in ZDF rats (Table 3). There were also negative correlations for serum adiponectin versus glucose, TG, FFA (for pioglitazone, r = -0.7005, -0.8603, and -0.9288 respectively; for GW347845, r = -0.9721, -0.8483, and -0.9453 respectively, all p < 0.01). Effect of pioglitazone and GW347845 in ZDF rats. **p < 0.01 vs ZDF lean rats. + p < 0.05 vs Vehicle-treated ZDF rats. ++p < 0.01 vs Vehicle-treated ZDF rats. N = 6–12 in each group. Adiponectin possesses insulin sensitizing and anti-atherogenic properties . In most clinical reports, primate studies, and genetic models, serum adiponectin level had been reported to be negatively correlated with body weight, visceral fat mass, and resting insulin level [10–13]. 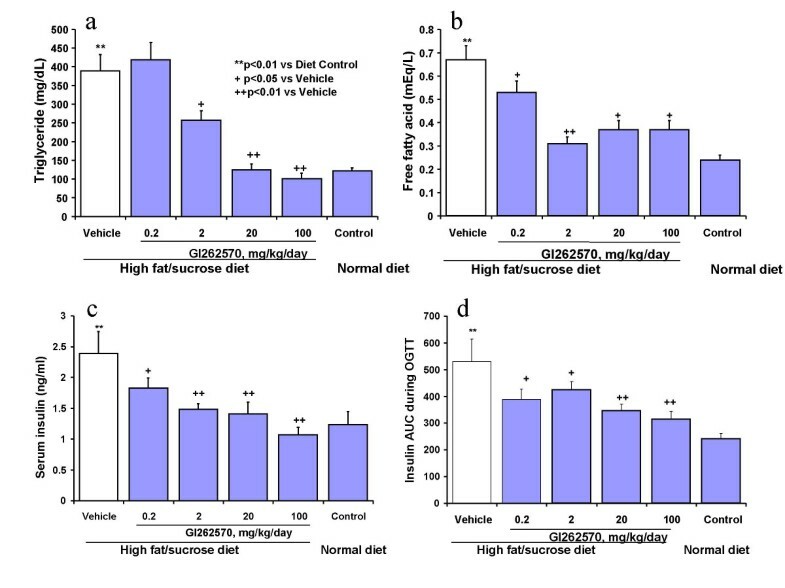 The present study showed that rats fed a HF diet had significantly higher serum insulin and lipids with in 2 weeks, which indicates insulin resistance. However, serum adiponectin level was not decreased by the diet up to 4 weeks. 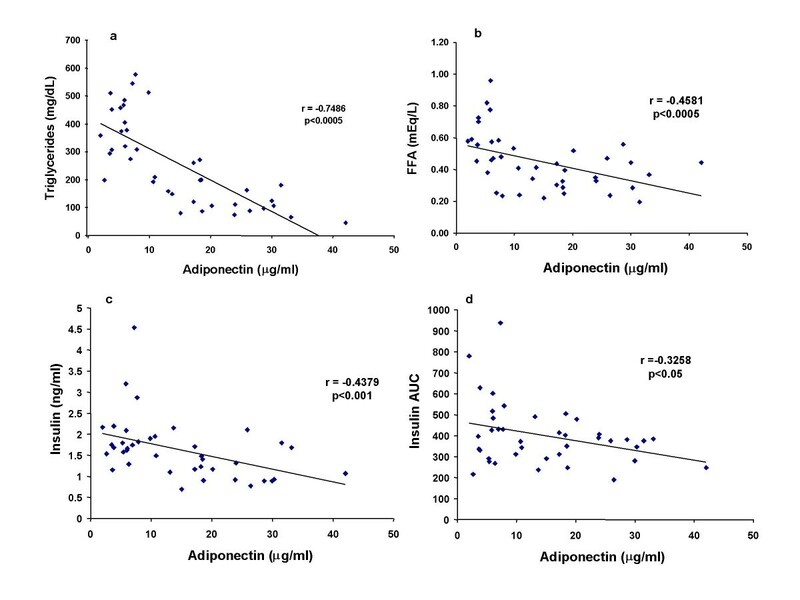 We have subsequently kept rats on the HF diet for up to 20 weeks, and observed a slight increase (instead of decrease) in serum adiponectin level (data not shown). Our data may suggest that the HF diet-induced insulin resistance happened much early than diet-induced change in serum adiponectin. Our data is consistent with studies by Naderali EK et al . In their report, 16 weeks of high fat/glucose diet resulted in significantly higher body weight, fat pad masses, plasma leptin, and higher plasma level of adiponectin, besides higher levels of plasma TG and FFA. PPARγ is a member of the PPAR family of the nuclear receptor superfamily . PPARγ agonists increase insulin sensitivity and circulating adiponectin [1, 2, 17, 18]. The response genes of PPARγ for in vivo PPARγ activation include LPL, AP2 and FABP3 [6, 7, 9]. The current study demonstrated that as in other species the PPARγ agonist GI262570 upregulated serum adiponectin level and adipose FABP3 mRNA level in SD rats in a dose-dependent manner. Interestingly, there is a positive correlation between PPARγ full agonist-upregulated serum adiponectin level and adipose FABP3 mRNA level, demonstrating the serum adiponectin level could be a biomarker for in vivo PPARγ activation. We did perform parallel experiments to check mRNA levels of PPARγ response genes FABP3, aP2 and LPL in epididymal fat. We found that basal level of FABP3 mRNA was very low compared to aP2 and LPL (FABP3:LPL:aP2 = ~1:250:2500), and that PPARγ agonist GI262570 dose-dependently increased FABP3 mRNA. AP2 was abundant in epididymal fat tissues, and was only slightly increased by GI262570 in a non-dose-dependent manner (data not shown). LPL was decreased in high fat diet fed rats, which was reversed by GI262570 but not dose-dependently (data not shown). With in vivo chronic exposure, the effect of PPARγ agonists on gene expression is difficult to separate from the effects on differentiation. In general we find aP2 a better marker of adipocyte differentiation than PPARγ activation. Since PPARγ agonist-mediated action in vivo may vary with organs/tissues (such as liver vs fat; subcutaneous fat vs omental or epididymal fat) [20, 21] and duration of treatment, all PPARγ response genes may not be changed in the same manner in one tissue following chronic treatment. 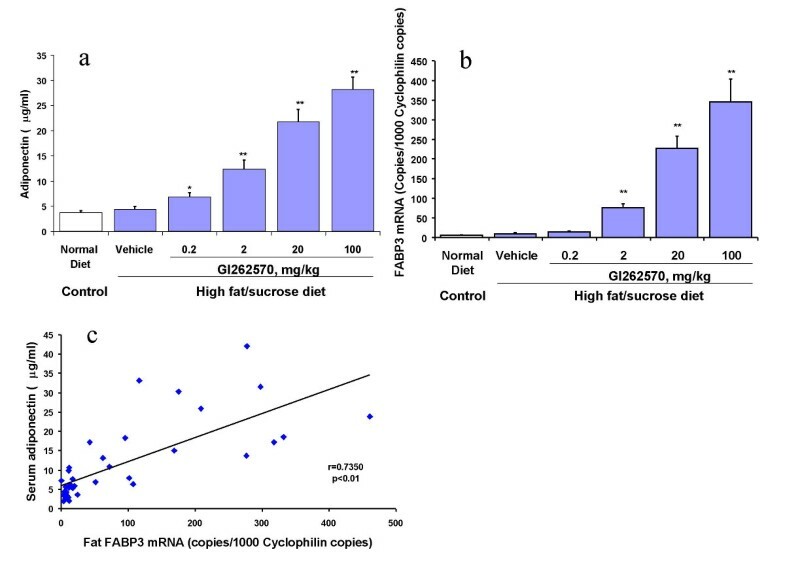 Therefore the authors consider that the dose-dependently GI262570 upregulated FABP3 mRNA in epididymal fat caught in the present study is of value for quantitative in vivo PPARγ activation. Thus the correlation data using FABP3 mRNA is of value. Adiponectin has been demonstrated to have an insulin sensitizing effect . Circulating adiponectin levels were positively correlated with insulin sensitivity, measured both by an euglycemic-hyperinsulinemic clamp and estimated by an oral glucose tolerant test, were negatively correlated with fasting lipids . The PPARγ agonist rosiglitazone increased plasma level of adiponectin, decreased fasting plasma glucose and HBA1C, and ameliorated insulin resistance in type 2 diabetic patients . However, the relationship between PPARγ agonist-increased circulating adiponectin and PPARγ agonist-induced efficacy on insulin resistance has not been studied. The current study showed that PPARγ agonists increased serum levels of adiponectin, ameliorated insulin resistance and lipid profile in both diet-induced insulin resistant rats and ZDF rats. There is a correlation between PPARγ agonist-increased serum adiponectin level and PPARγ agonist-induced efficacy in insulin sensitivity/lipid lowering. These data provide a link between PPARγ agonist-elevated circulating adiponectin level and PPARγ agonist-mediated efficacy in insulin sensitivity and lipid lowering, and indicate that serum adiponectin level could be a biomarker for in vivo PPARγ efficacy. Other adipokines, such as leptin, are important in obesity and insulin resistance. Unlike adiponectin, leptin is positively correlated with fat amount, mass and percentage . It has been reported that PPARγ agonists inhibit the expression and function of leptin [24, 25]. Our unpublished study showed that high fat diet resulted in insulin resistance and higher serum leptin level in rats. Treatment of these insulin resistant rats with PPARγ agonist GW7845 improved insulin sensitivity, but did not affect serum leptin level. Therefore leptin is not considered to be a marker for PPARγ efficacy. There are indices for in vivo PPARγ activation (i.g., adipose FABP3 mRNA), or for in vivo PPARγ efficacy on insulin sensitization (i.g., serum insulin and glucose). These indices can not be used to represent both in vivo PPARγ activation and in vivo PPARγ efficacy on insulin sensitization. It is well known that circulating adiponectin increases insulin sensitivity , is decreased in T2D patients [10–13], and is negatively correlated with insulin resistance ; PPARγ agonists increase insulin sensitivity as well as circulating adiponectin [17, 18]. The correlations, serum adiponectin vs adipose FABP3 mRNA and serum adiponectin vs insulin/lipids, in our study demonstrated that serum adiponectin is a good biomarker for both in vivo PPARγ activation and in vivo PPARγ efficacy on insulin sensitization. These studies demonstrated that in both diet-induced and genetic rat models of insulin resistant (metabolic) syndrome the full PPARγ agonists GI262570, GW347845, and pioglitazone significantly elevated serum adiponectin levels, increased adipose transcription of the PPARγ response gene FABP3, and were efficacious as expected. This is the first demonstration of correlation among PPARγ agonist-increased serum adiponectin, PPARγ agonist response gene mRNA, and PPARγ agonist-mediated efficacy in insulin sensitivity and lipid lowering. These data indicate that serum adiponectin can serve as a biomarker for both in vivo PPARγ activation and PPARγ agonist-induced efficacy in rats. All procedures performed were in compliance with the Animal Welfare Act and U.S. Department of Agriculture regulations, and were approved by the GlaxoSmithKline Animal Care and Use Committee. Male caesarian derived Sprague Dawley rats (SD, 225–250 g) (Charles River, Indianapolis, IN) were fed rodent chow Purina 5001 (Harlan Teklad, Indianapolis, IN). Male Zucker diabetic fatty (ZDF) and male Zucker lean rats (8 weeks old) (Genetic Models, Indianapolis, IN) were fed Formulab Diet 5008 (PMI Feeds, Richmond, IN). After an adaptation period of 1 week, SD rats were fed a HF diet (TD88137, Containing 34.146% sucrose. 42% of calories from fat. Harlan Teklad, Indianapolis, IN) for 4 weeks. SD Rats fed chow Purina 5001 served as normal diet control. SD rats on HF diet were treated with vehicle (0.5% hydroxypropyl methylcellulose and 0.1% Tween 80), PPARγ agonist GI262570 [7, 26–28] (0.2, 2, 20, or 100 mg/kg, QD), or PPARγ agonist GW347845 (3 mg/kg, BID) for the last 2 weeks. ZDF rats were gavaged twice daily for 14 days with vehicle, PPARγ agonist pioglitazone  (3, 10, or 30 mg/kg), or PPARγ agonist GW347845 (3 mg/kg) [29, 30]. Zucker lean rats were gavaged twice daily for 14 days with vehicle. One day prior to the end of dosing (after 13 days of dosing), serum was obtained from tail vein of SD rats for determining postprandial levels of glucose, insulin, triglycerides, free fatty acids, and adiponectin. The SD rats were then implanted with a jugular cannula. Oral glucose tolerant tests (OGTT) were performed in these SD rats after 14 days of dosing. At the end of the study, SD rats were euthanized with CO2. White adipose tissue (WAT, epididymal fat pad) were saved for determining mRNA levels of PPARγ response gene FABP3. In Zucker rats, serum was collected after 2 weeks of dosing for determining postprandial levels of glucose, insulin, triglycerides, free fatty acids, and adiponectin. Zucker rats were then euthanized with CO2. Serum glucose, triglycerides, and free fatty acids were measured using Ilab600 Clinical Chemistry System (Instrumentation Laboratory). Serum adiponectin of SD rats was determined by using adiponectin RIA kit (Linco Research, MO), according to the manufacture's instruction. Serum adiponectin of ZDF rats was determined by using adiponectin ELISA kit (B-Bridge International, CA), according to the manufacture's instruction. Under anesthesia with isoflurane, surgical site was prepared using standard aseptic technique (with Hiboclens® Chlorhexidine Gluconate, Zeneca Pharmaceuticals, Delaware). A longitudinal incision was made over the right external jugular vein. 5–10 mm of the vein was exposed by blunt dissection. Jugular cannula (Access™ Technologies, IL) was inserted into the vein for about 1 inch. The cannula was secured using sterile sutures. The cannula was routed subcutaneously, exteriorized between the scapulae. The cannula was then filled with dextrose-heparin solution (50:50), and heat sealed. Rats implanted with jugular cannula were fasted overnight. The following morning, dextrose (0.5 g/ml in water, 2 g/kg body weight) was administered by oral gavage. Blood samples (0.3 ml/time) were obtained from the jugular cannula before gavage, 10, 20, 30, 45, 60, 90 and 120 min after gavage. Blood glucose was immediately measured by using Elite® XL Glucometer (Bayer, Tarrytown, NY). Serum was collected for insulin measurement. Area under curves (AUCs) for glucose and insulin during OGTT were calculated by using WinNonlin™ Noncompartmental Model 200. Serum insulin of SD rats level was determined using Rat Insulin ELISA kit (Crystal Chem Inc, IL), according to the manufacture's instruction. Serum insulin level of ZDF rats was determined using Igen's M-SERIES M-8 Analyzer (Igen International, Inc., Gaithersburg, MD). Total RNA in epididymal fat pad was isolated by the TRIZOL® method . All RNA samples were DNased using the DNA-free™ kit (Ambion – according to protocol). The samples were then quantitated by RiboGreen™ (Molecular Probes – according to protocol). GAPDH gene expression was analyzed in the absence of reverse transcriptase to ensure the samples were free of genomic DNA. The samples were then converted to cDNA using the High Capacity cDNA Archive Kit (Applied Biosystems – according to protocol). Samples were diluted to a final concentration of 5 ng/ul of cDNA. PCR results were generated using the 5' nuclease assay (TaqMan)  and the ABI 7900 Sequence Detection System (Applied Biosystems, Foster City, CA). Primers and probe for FABP3 are: Forward-GTCGTGACACTGGACGGAGG; Reverse-TTCCCATCACTTAGTTCCCGTG; Probe-CAGAAGTGGGACGGGCAGGAGACTACG. The primers and probe for Cyclophilin are: Forward-TATCTGCACTGCCAAGACTGA; Reverse-CCACAATGCTCATGCCTTCTTTCA; Probe-CCAAAGACCACATGCTTGCCATCCA. A master mixture was utilized which included 900 nM each of the forward and reverse primers, 100 nM probe, and 1 × PCR master mix (Applied Biosystems). The PCR reaction consisted of 12.5 ng of cDNA in a 12.5 ul total reaction volume. The PCR cycling conditions were 95°C for 10 minutes, and 40 cycles of 95°C for 15 seconds and 60°C for 1 minute. There was a minimum of 5 rats for each data point. Data are presented as mean ± SEM. Correlation between two parameters and the significant level of correlation were analyzed by Pearson correlation analysis. Differences between vehicle and treated groups were analyzed by two-way ANOVA. P less than 0.05 was taken to be significant. We thank Qiming Liao for his assistance in statistical analysis, and Jane Binz for her assistance in measuring serum glucose, triglycerides, and free fatty acids. BY is the principal investigator. LC, LGC, JM, and DW participated in the in vivo experiments. KC and JS performed the real time PCR. KB, SS and GP participated in study design and manuscript preparation.